Oracle CEO Larry Ellison steps down: Mark Hurd, Safra Catz to become CEO. 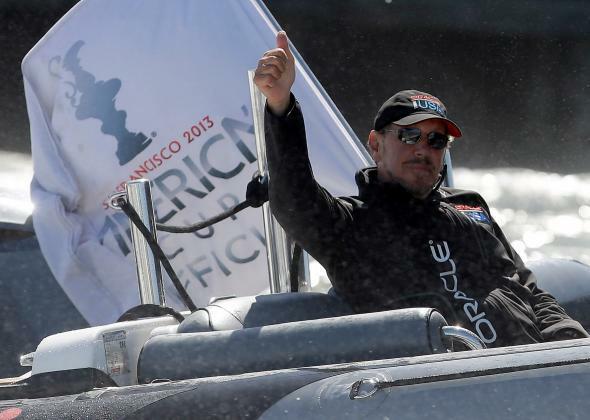 Oracle’s Larry Ellison is stepping down as CEO … and, presumably, onto the deck of one of his famous yachts. CNBC reports that the world’s fifth wealthiest person announced his resignation on Thursday, “effective immediately.” He’s not sailing into the sunset just yet, though: Ellison, 70, will stay on for the time being as executive chairman and chief technology officer. Bizarrely, he will be replaced by not one but two new CEOs, and apparently their names are Herding Cats. Just kidding, their names are Hurd and Catz. Mark Hurd and Safra Catz, who had been serving as the company’s presidents, will not be co-CEOs, CNBC clarifies. Rather, both will be named CEO. This may or may not end well. Ellison’s unexpected departure marks a new tack for the Silicon Valley company that he-cofounded in 1977 and has led ever since. He built Oracle from a startup focused on relational-database software into a 120,000-employee multinational corporation focused on, well, relational-database software, but also some other types of hardware and software and, you know, business-y stuff. 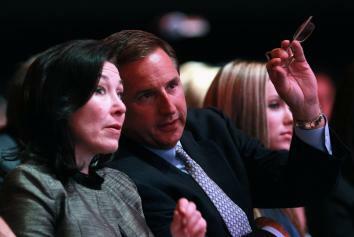 New Oracle CEO Safra Catz (left) and new Oracle CEO Mark Hurd (right). Over the years the brash Ellison has been a mainstay atop various lists of the world’s richest people, highest-paid CEOs, and most humongous boats. Last year the U.S. sailing team he sponsored won the America’s Cup in a comeback that stirred the hearts of seafaring folk and plutocrats worldwide. Earlier this year Ellison’s lavish means of transportation made waves when the Wall Street Journal reported that he employs a guy in a powerboat to follow along behind his yacht and retrieve his errant basketball shots. It will be interesting to see how Hurd’n’Catz fare in his place at the helm of a mature software company that remains profitable but faces challenges to its database dominance and is playing catch-up in the cloud. At least we need not fear that Ellison’s departure will create a controversy vacuum at the top. Hurd brings to the table a checkered history from his time as chairman of Hewlett-Packard, where he resigned amid allegations of sexual harassment by a former reality TV actress. The CEO Bought a Yacht? Time to Sell.